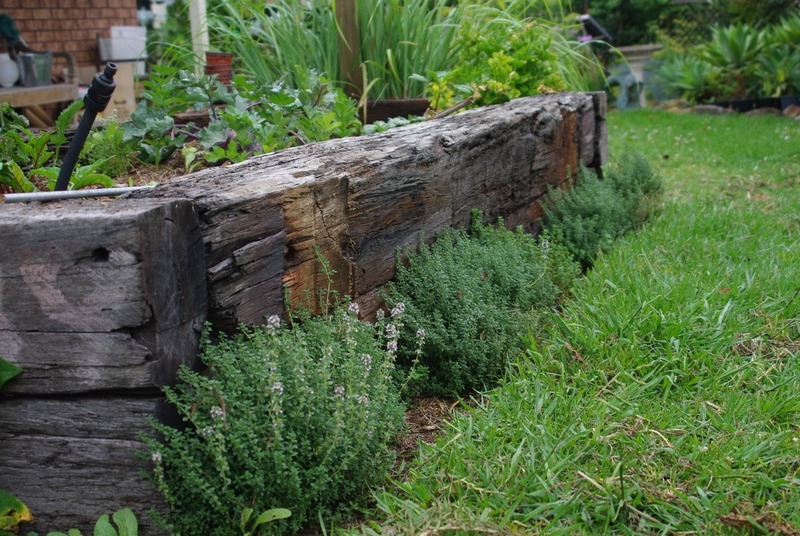 In Permaculture you learn that edges are the most productive area of the landscape. All the nutrients you give the soil leech down and suddenly you’ve created a huge amount of extra work for yourself as the lawn grows 3 times faster on the edges. 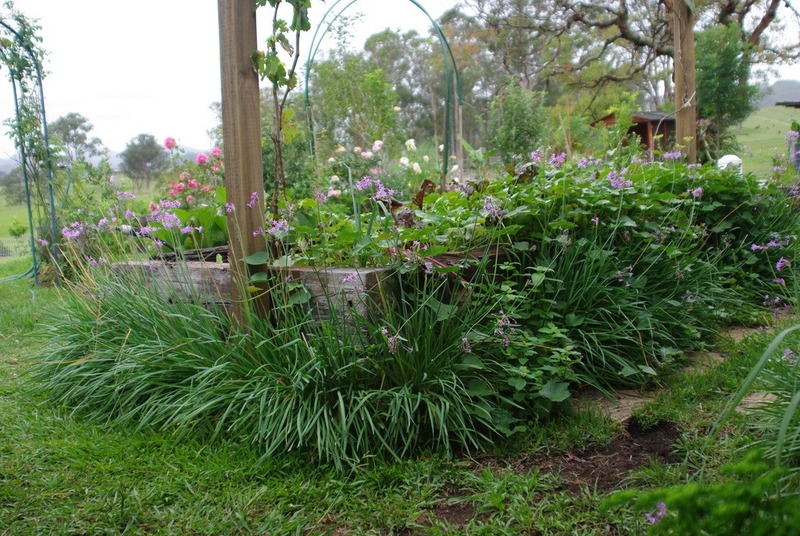 Our kikuyu lawn rapidly develops long runners going up into the raised beds and along this fertile edge. We were having to use extra time and energy with the old Whipper Snipper or Pelican Sheers. 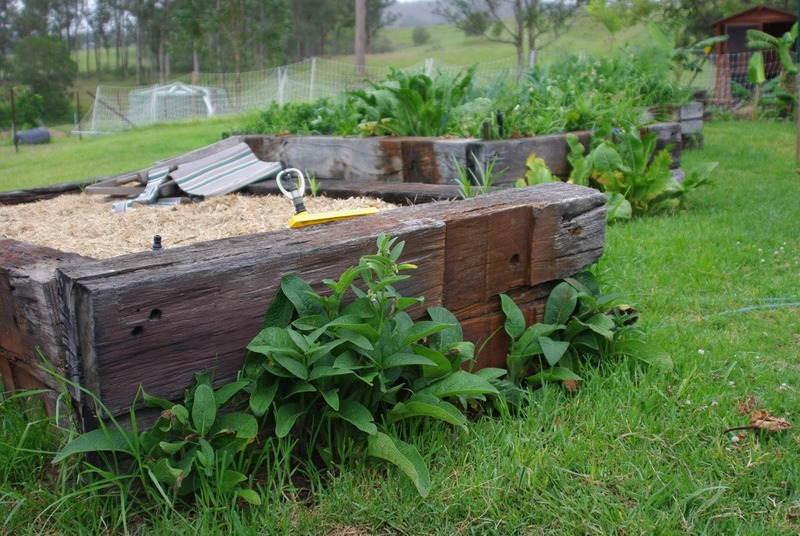 After a gentle reminder from our old Permaculture teacher, Darren Doherty, when he came to do our farm consult, I started to experiment using different plants that we like to either eat, cook with or use as mulch or compost. The experiment has been a success! It is established and now there is very little edging required, I can mow as close as I want, have a variety of great herbs and it looks beautiful. Thanks Daz! This edge (facing south) was done with comfrey. It’s been successful as far looking good with it’s beautiful pink bell like flowers, makes great compost, a wonderful ointment and the dogs like to nibble it from time to time. An edge which facing north was also planted with comfrey, it hates the hot sun and lies down and looks most distressed and quite crisp – not a success so will be replaced with either thyme or garlic chives. This edge with mint has been quite successful as far as providing a good supply of mint to add to summer drinks and our cooking but the kikuyu runners get through and must be regularly removed and the mint needs to thicken up so lots more pruning required. Thyme and lemon thyme (facing north). It’s so productive and prolific, we’ve never had so much thyme before. Sadly it doesn’t stop kikuyu runners but will stay because we love it. It tasted great and smells gorgeous when you walk on it or mow. Garlic chives aka Society Garlic aka Gentlemen’s Garlic. Far and away the star performer in this experiment. There was massive clumps of this around the back of the house. The big clumps tease apart easily, you plant it and stand back and watch it grow. 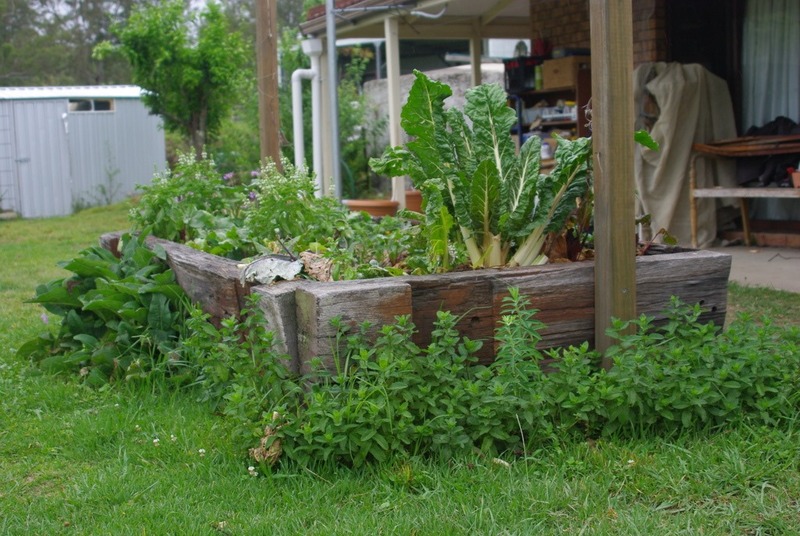 It thickens up quickly – the leaves taste like mild garlic and go well in salad or with rice and pasta, the flowers are so pretty, taste great and are wonderful in salad AND this plant forms an impenetrable rhizome barrier that kikuyu cannot get through, still leaving easy access to the raised bed. Lemon Grass on end, peppermint on long side. 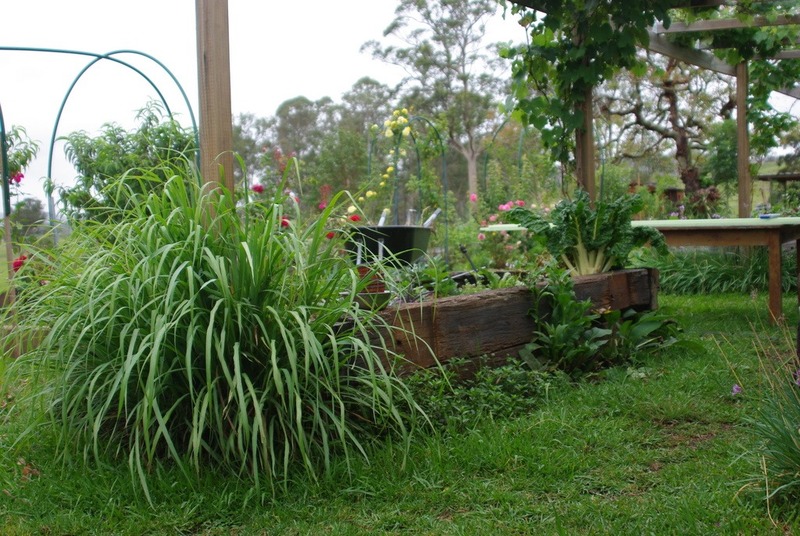 We use a lot of lemongrass in cooking, it makes great mulch and keeps out the bloody kikuyu. It does quickly get oversized and makes access to the garden quite difficult… Peppermint has been lovely. We hope with time it will thicken up. It smells so good and feels so good when you walk on it or mow it. 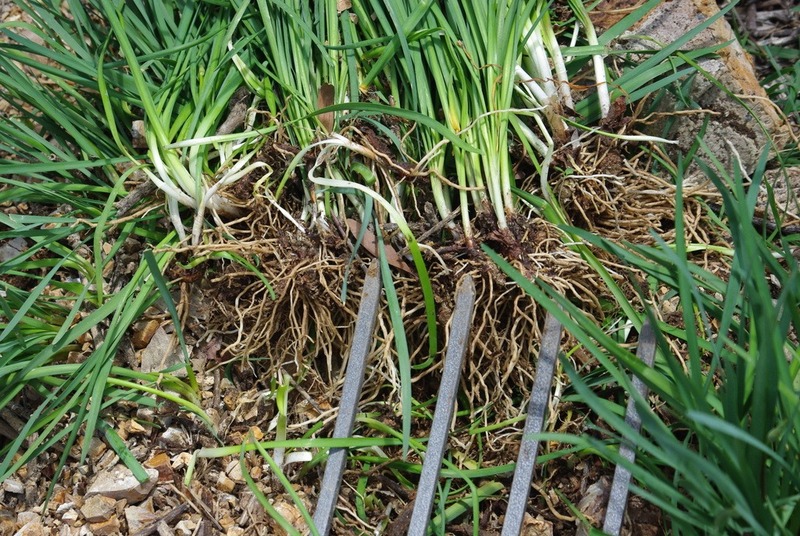 As the star performer, I’ve now planted society garlic along the path to front door so we don’t need to edge. Now I’m using it along the long middle bed (not raised) as a rhizome barrier against the dreaded kikuyu and have also started planting at the back of the bunds in the orchards.